This impressive gluten-free pie is bursting with sumptuous flavours. It’s perfect for lunch in the garden but also makes for an impressive dish for when you have guests over. For the pastry, combine the flour mix, xanthan gum, salt, butter and shortening in a food processor and pulse a few times until the mixture resembles rough breadcrumbs. Add 2 tbsp of the water and pulse until a dough forms around the blade of the processor, adding more water as needed by the tablespoon to bring it together. Once the dough comes together, turn it out and shape into a disc. Wrap in clingfilm and chill for at least 30 minutes. After chilling, preheat the oven to 170°C/Gas Mark 3. Roll out the chilled dough on a lightly floured surface 7.5mm (1/3in) thick and use it to line the base and sides of a 20cm (8in) pie dish or tart tin. Trim away any excess overhanging pastry and prick the base all over with a fork. Chill until needed. For the filling, heat the olive oil in a sauté pan set over a moderate heat until hot. Add the red pepper, broccoli and salt, sweating until the pepper is just softened, 2-3 minutes. Set off the heat to cool. 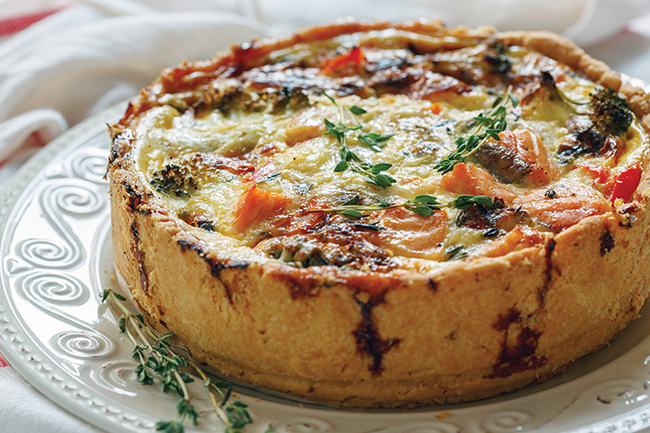 Arrange the red pepper, broccoli and salmon in the lined pastry before pouring over the egg custard mixture. Scatter the thyme leaves on top. Bake the quiche for about 1 hour until the pastry is golden-brown and the filling is set and golden-brown on top; it should wobble slightly when poked. When ready to serve, garnish with thyme sprigs before slicing and serving.